Draupadi was an ambitious lady in her previous birth. This led to a strange situation. Please read through the article for details. Draupadi, the wife of five pandavas, had an eventful life. She was born when Drupad performed yagya to take revenge from Drona. She was born alongwith Dhrishtdyumna, who fought the war of Mahabharata with pandavas. She became the wife of all Pandavas not by an accident, but by design. Shri Krishna explained to her that she prayed to Shiva to grant her a husband with fourteen desired qualities. Shiva, pleased with her devotion, tells her that it is very difficult to get a husband with all fourteen qualities that she desired. But she sticks to her ground and asks for the same. Then Lord Shiva grants her wish saying that she would get the same in her next birth with fourteen husbands. She asked for these qualities in her previous birth. She was Nalayani – daughther of Nala and Damayanti. She queried Lord Shiva was this a boon or curse? Shiva promised that she would regain her virginity each morning when she took bath, this was the Lord Shiva’s boon to her. Thus, she had the unique quality of remain virgin throughout her life because of the boon from Shiva. The fourteen qualities which she wanted were available in five pandavas.The just Yudhisthira for his wisdom of Dharma; The powerful Bhima for his strength that exceeded that of a thousand elephants combined; The valiant Arjuna for his courage and knowledge of the battlefield; the exceedingly handsome Nakula and Sahadeva, for their love. She also had a wooden bowl, which will always be filled with food. It was presented Draupadi when thepandavas were exiled. This bowl helped the Pandavas to survive during their exile in inhospitable forests. It is said that Dhanyalakshmi presented Draupadi this bowl. Draupadi refused participation of Karna in swayamvar. She refused to be the wife of a suta-putra (son of a charioteer). Though Karna could also have won the competition of pierecing the fish’s eye. The seeds of Mahabharata war were sown by her. 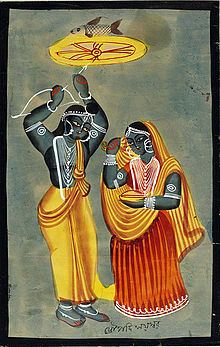 It is said that Draupadi said about Duryodhana that blind’s son are also blind. This happened when Duryodhan slipped in the fabulous palace of Indraprastha. According to Narada Purana and Vayu Purana, Draupadi is the composite Avatar of Goddesses Shyamala (wife of Dharma), Bharati (Wife of Vayu), Shachi (wife of Indra), Usha (wife of Ashwins), and Parvati (wife of Shiva), and hence married their earthly counterparts in the form of the five Pandavas. In earlier lives, she did assume important avatars. The first time was as Vedavati who cursed Ravana (who is another goddess Avatar Swaha, wife to Agni). She then came in place of Sita’s avatar, to be the cause of Ravana’s death, while Agni hid the real Sita. Her third incarnation was partial: either Damayanti (whose husband, Nala, was equivalent to Dharma, Vayu, and Indra, just like the Pandavas) or her daughter Nalayani. She married Sage Mudgala. The fifth avatar was Draupadi herself. So, we find in Draupadi, a composite avatar of Kali, Parvati, Shachi, Shyamala, Usha, Bharati, Shree, and Swaha, the eight goddesses. She is one of the Panchkanya’s, alongwith Kunti.